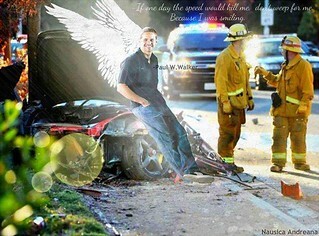 So for my final project I did a short trailer with Paul Walker. And took some clips from the second film Fast and Furious. I take some clips where Paul was acting either serious or very funny. In put them together and made as the movie was him being bipolar throughout the whole way. My favorite part was adding the voices. I ask my cousin Carlos , to do the voices with deep voice. Which I found very hilarious since we always doing these silly voices. And I incorporated them into the scenes where they have titled in them. I also added a car tires squealing into one of the scenes, where i gotten my sound from Soundbible. I also added a child screaming in of the part of the trailer, which i also gotten it from Soundbible. I wanted my trailer to be short and funny and gets to the point. And I had a choice to added another character but I felt like Walker , had many funny scenes in the movies without even trying to be funny. Which it come out naturally. And I focus more on the sounds then they clips because I wanted to show that I had learned something in this class. Which it wasn’t so focusing on the trailer just the sound.since I have not yet taken a course on moving pictures. So i wouldn’t have much knowledge on making a good trailer . What I learned from doing this project time is the key when you are adding any sound to any film. If you don’t have nail down with the moving picture or is off by inch it throws out the whole scene off. Which sound is the main course for making your project come to live . I also learn that you could control the volume, while you have it embed into your project . Also what i learn from re-doing the project again was volume is the key point. This is the second one I made with all the comments i was giving. This entry was posted in projects, recording, storytelling on December 17, 2013 by ohdavis. So glad that you made the effort to remix the piece one more time. The “Barry White” voice comes through much more clearly and allows me to get the sense of humor! 🙂 I think it might be interesting to play with that a little more and use a Barry White tune which is slow and overly romantic. It would be interesting to see/hear it would become a love song that Walker sings to himself about loving himself.